The above picture was shown in a presentation by my prof in inorganic chem as we were discussing ionic radii more in depth (all in pm). 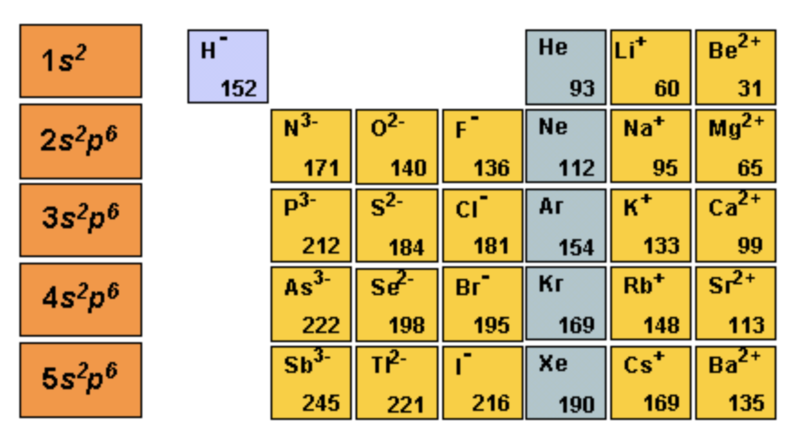 These are all isoelectronic radii. Notice the sudden leap in radii going from the 6th main group to the 5th main group. Its about 30 pm overall. Now how can that be? Is this a known thing? You lose a proton in the nucleus, but so do you when you go from the halides to the 6th main group. I unfortunately don't know the source of this picture, but my prof was sure that it came from a reliable source. Browse other questions tagged inorganic-chemistry ionic-compounds atomic-radius or ask your own question. Can ionic and atomic radii be compared? Why does the “gap” between atomic radii get smaller down the periodic table? Why ionic radii of Cu2+ is less than Zn2+? Newer ionic radii data than Shannon's 1976 compilation?